No, we're not ending Killer Crafts & Crafty Killers. But today author Lois Winston, who writes my eponymous series (and constantly risks my life and limbs), is here to talk about a joint venture that is coming to an end. If you want to read about me and some of my fellow sleuths for only a few pennies, you don't have much longer to take advantage of this great deal. A few years ago sales of multi-author ebook box sets became very popular. For authors it was a way of getting their books in the hands of readers who may never have heard of them or their titles. For readers it was a way to try a book by one or more authors they’d never read without having to spend a lot of money. At .99 cents for ten full-length books, it was a hard-to-resist bargain. The participating authors didn’t make much money, but the goal was to increase their readership, not their pocketbooks. If a reader liked one or more of the stories, hopefully that reader would then go on to buy other books by those authors. After participating in several romance box sets, I came up with the idea of creating a box set comprised of the first book in ten different mystery series. Sleuthing Women: 10 First-in-Series Mysteries launched on May 1, 2016. Now two years later that box set is retiring at the end of the month. If you never picked up your copy, now is the time. You only have until the end of this month. Come May those ten titles will cost $30.90. 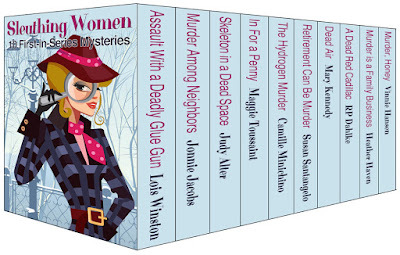 Sleuthing Women: 10 First-in-Series Mysteries is a collection of full-length mysteries featuring murder and assorted mayhem by ten critically acclaimed, award-winning, and bestselling authors. Each novel in the set is the first book in an established multi-book series—more than 3,000 pages featuring amateur sleuth, caper, and cozy novels. Murder Among Neighbors, a Kate Austen Suburban Mystery by Jonnie Jacobs — When Kate Austen’s socialite neighbor, Pepper Livingston, is murdered, Kate becomes involved in a sea of steamy secrets that bring her face to face with shocking truths—and handsome detective Michael Stone. Skeleton in a Dead Space, a Kelly O’Connell Mystery by Judy Alter—Real estate isn’t a dangerous profession until Kelly O’Connell stumbles over a skeleton and runs into serial killers and cold-blooded murderers in a home being renovated in Fort Worth. Kelly barges through life trying to keep from angering her policeman boyfriend Mike and protect her two young daughters. In for a Penny, a Cleopatra Jones Mystery by Maggie Toussaint—Accountant Cleo faces an unwanted hazard when her golf ball lands on a dead banker. The cops think her BFF shot him, so Cleo sets out to prove them wrong. She ventures into the dating world, wrangles her teens, adopts the victim’s dog, and tries to rein in her mom…until the killer puts a target on Cleo’s back. The Hydrogen Murder, a Periodic Table Mystery by Camille Minichino—A retired physicist returns to her hometown of Revere, Massachusetts and moves into an apartment above her friends' funeral home. When she signs on to help the Police Department with a science-related homicide, she doesn't realize she may have hundreds of cases ahead of her. Retirement Can Be Murder, A Baby Boomer Mystery by Susan Santangelo—Carol Andrews dreads her husband Jim’s upcoming retirement more than a root canal without Novocain. She can’t imagine anything worse than having an at-home husband with time on his hands and nothing to fill it—until Jim is suspected of murdering his retirement coach. Dead Air, A Talk Radio Mystery by Mary Kennedy—Psychologist Maggie Walsh moves from NY to Florida to become the host of WYME's On the Couch with Maggie Walsh. When her guest, New Age prophet Guru Sanjay Gingii, turns up dead, her new roommate Lark becomes the prime suspect. Maggie must prove Lark innocent while dealing with a killer who needs more than just therapy. A Dead Red Cadillac, A Dead Red Mystery by RP Dahlke—When her vintage Cadillac is found tail-fins up in a nearby lake, the police ask aero-ag pilot Lalla Bains why an elderly widowed piano teacher is found strapped in the driver’s seat. Lalla confronts suspects, informants, cross-dressers, drug-running crop dusters, and a crazy Chihuahua on her quest to find the killer. Murder is a Family Business, an Alvarez Family Murder Mystery by Heather Haven—Just because a man cheats on his wife and makes Danny DeVito look tall, dark and handsome, is that any reason to kill him? The reluctant and quirky PI, Lee Alvarez, has her work cut out for her when the man is murdered on her watch. Of all the nerve. Murder, Honey, a Carol Sabala Mystery by Vinnie Hansen—When the head chef collapses into baker Carol Sabala’s cookie dough, she is thrust into her first murder investigation. Suspects abound at Archibald’s, the swanky Santa Cruz restaurant where Carol works. The head chef cut a swath of people who wanted him dead from ex-lovers to bitter rivals to greedy relatives.